Cádiz and some relaxing Sherry for not such a high tarifa. Tucked away in the southwest part of Spain, between Huelva, Sevilla and Gibraltar with views of Morocco, Cádiz is, like every Spanish province, a contrast of many things. And as a Pearls Before Swine fan, I just had to make a pun out of this entry’s title. Cádiz is known for its beautiful pueblos blancos (villages with white architecture), beautiful beaches and being home of Jerez de la Frontera, where they make sherry (Jerez is Spanish for “sherry”. It’s also home of the rainiest part of the peninsula, the Sierra de Grazelema. I’m not even going to ask how a place could be rainier than Bilbao because I don’t even want to consider that possibility. I spent two summers working at a summer camp in Jerez, a beautiful andaluz city famous for its horses and for its sherry. It wasn’t as hot as some places in Andalucía (in fact, some nights I needed a jacket). The less said about the camp, the better, but I do have fond memories of the city. My favourite was my afternoon off when I was able to visit Cádiz, the province capital city. I walked all around the town, imagining Havana in Cuba (which is said to be very similar). I remember having a very cheap café con leche and admiring a beautiful sunset over the beach. On the train back to Jerez, there were some lovely fireworks. I also got to tour Tío Pepe, one of the sherry bodegas in Jerez. For the life of me, I can’t remember if I ever made it to El Puerto de Santa María or not. I do know I was in charge of a bunch of rowdy teens most of the time (which included supervising them playing golf, of all sports) and had no time to explore this beautiful province…although with the winter I’m still recovering from, I’m not wanting to go to the rainiest point of the peninsula any time soon. By the way, the people of Jerez strongly feel that flamenco was born in Jerez and not Sevilla. I asked my amigo andaluz from the east part of Andalucía who has no stake in this debate, and he says it is from the north part of Cádiz and the south part of Sevilla, so both are correct. Cádiz is the oldest continuously lived in city in Spain and comes complete with an old town and old city walls. Nearly 124,000 people call the city home. The metropolitan area is over 600,000 habitants. The Phonetians called it “Gadir”/”Agadir”. It’s located on a sand spit of land, which causes development problems. Today, besides the beaches and the Bay of Cádiz, the city has a cathedral, many beautiful plazas and churches, the monument to the 1812 Spanish Constitution, the Tavira watchtower, a Roman theatre and the Castle of Santa Catalina. It also has Carnivales. Río is not the only place in the world with Carnival. Every year, Carnivales become more popular in Spain as people dress in costumes. (As Halloween has been adopted into Spanish culture, the Spanish differentiate between Carnival and Halloween by only wearing scary costumes on Halloween. I’ve been called a liar when I explain that in the United States people wear any type of costume for Halloween. I digress). One of the most important Carnivals (if not the most important) is the Carnival of Cádiz. Cádiz has special groups called “chirigotas” who provide satirical music and performances as everyone dresses up in costume/fancy dress. The “comparsas” work all year on their satire, and there are also “coros” providing music. Jerez is the largest city of the province with 215,000 habitants and is the fifth-largest city in Andalucía. Located 12 kilometres (7.5 miles) from the Atlantic Ocean, it is included in the Cádiz metropolitan population of over 600,000. They have a cathedral, la Cartuja de Jerez de la Frontera monastery (a Bien de Interés Cultural), an alcázar (fortress), many churches and plazas, sherry and horses. Despite having lived there six weeks, I didn’t have much of a time to explore the city. I was left with a favourable impression from what little I did see. The pueblos blancos are villages where the houses all have white walls and red/brown tiled roofs. There are a series of connected villages with this look in Cádiz and Málaga. The towns all have a Catholic church and narrow, winding streets. They were first painted white during the Miguel Primo de Rivera dictatorship in the 1920s. There are a ton of hiking and other outdoor activity opportunities here. Tarifa, population of nearly 18,000, is located at the very south of the province on the Strait of Gibraltar. The word “tariff” comes from here as it was the first port to charge for its use. It’s home of the Guzmán Castle, the church of St. Matthew, the ferry to Tangier, Morroco, and many wind sports. Grazalema is a village of 2200 people located in the foothills of the Sierra de Grazalema Natural Park. It is more or less the middle point of the Cádiz-Sevilla-Málaga triangle, allowing for easy access from any of the major cities. The park is home of many caves and vultures. It is said to be the rainiest part of the peninsula and has been a biosphere reserve since 1977. Nine Cádiz populations and five Málaga populations (including Ronda) have territory within the park boundaries. Sanlúcar, population 68,000, is located in the northwest of the province on the banks of the Guadalquivir river, about 50 kilometres from Cádiz (30 miles). It is home to some beaches, the Santiago Castle and a few palaces (including city hall) and churches. It’s one of the cities that produces sherry. It’s also close to the Doñana National Park. Camino de Santiago (Camino del Norte) Etapa 10: Ortuella-Castro Urdiales. I’ve arrived to Cantabria, and then some. Saturday, June 20, has been my longest day on the Camino in terms of kilometres (there have been days that have seemed longer with a lot less kilometres). 38.4 of them. That’s 23 miles for the people from the United States reading this. I really didn’t mean for it to be so many, but I have reached a good “stopping point”, should I need to take an extended break and come back to the Camino later: Castro Urdiales (Castro). It started out innocently enough. I arrived in Ortuella, had a café con leche as there were no pintxos de tortilla at the early hour of 9, and walked back to the fork in the Caminos to walk the one on the itinerary from Eroski. It was the bidegorri from hell (bidegorri is Euskera for bike path). It went on and on and on and on and on and on and had been going on since Sestao on the previous day. And it being a Saturday morning, a ton of people were out and about getting their morning exercise in as it was a beautiful day, about 25ºC (mid 70s F). I walked on. The bar along the way that is said to give stamps for credenciales was closed this Saturday morning. Grrrr. Then I came to a fork in the road where one path went away from the bidegorri, and the other path didn’t. I opted for the one that didn’t as I did NOT want to deal with more bikes. I later found myself in a neighbourhood where the señoras were nice enough to tell me which way to go when I was confused and there was no arrow. Vizcaya may have 500 arrows to get out of Termibus, but they seem to have no arrows at some confusing places. They said just go to the beach, so I did. I’ve been to the beach in Muskiz, La Arena, before, and it’s quite nice. I wasn’t sure how far I was going to walk. I stopped for my pintxo de tortilla and a wifi check as I had to answer some important emails. It was 10 kilometres (6 miles, that one’s easy!) from Ortuella, and it had gone by fast. 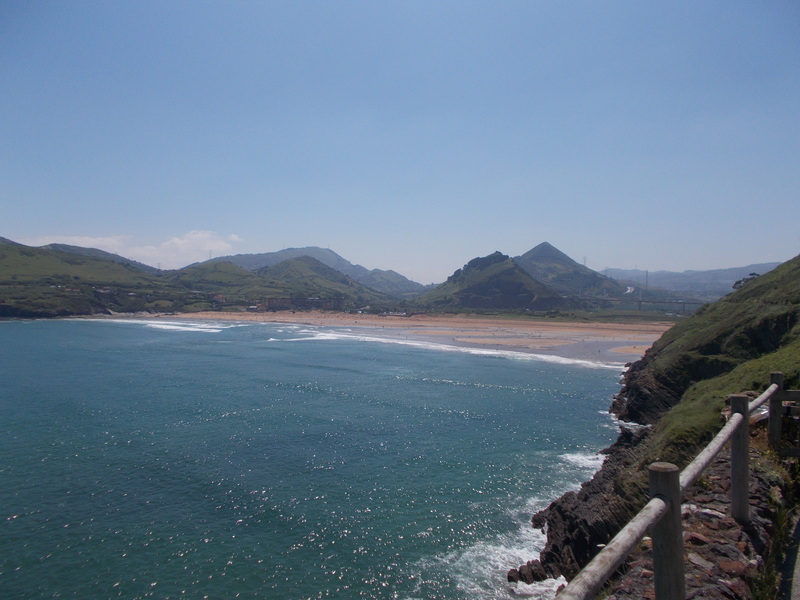 I wasn’t ready to end my day, and I wanted to arrive to Cantabria, which is very Spanish. So I continued past the bridge and up some stairs to some incredible views of Pobeñas. I wanted to take more picture, and the guy at the snack bar kept saying “El Camino por allí!” (The Camino goes that way). I was like “I know, I know!” Leave me alone to admire the beauty. I ran into some Spanish peregrinos who had been swimming in the beach, and I am mad I didn’t stop for a dip in the sea. I wonder how far they got. I’m not sure at what point the Camino entered Cantabria, but I was planning on stopping in Ontón and catching either the 1:30 or 4:30 PM bus back to Bilbao. Alas, God was laughing at me for my plans. Oh how he was laughing. I was so impressed with the stretch between Pobeña and Ontón and planning on a menú del día en Ontón. Ontón had some beautiful ruins and a closed bar and some yellow arrows I mistakenly followed. Oh, just a little bit more to a bigger town with the bus stop and food! Santiago 630 km or so away! So I continued on. Even here, I could’ve backtracked, but I still hadn’t broken out the guide. As I began to ascend La Helguera, I decided to see what villages were around I could take a bus on to Castro or back to Bilbao. This is when I read about the shortcut along N-634. (The shortcut does have the more impressive entrance to Castro, as I was on it during my last visit to Castro. However, the traditional Camino is beautiful. For those staying in Pobeñas, I recommend this Camino. For those wanting to do Portugalete-Castro, take N-634). The vías verdes (old train tracks converted into walking paths) took me through some beautiful mountain scenery. Otañas looks quite nice too, although I only admired it from the path. I ran into some cows and some donkeys running away today. I also found three four-leaf clovers in one place while resting a bit. I suppose I’m about to run into better luck. In Santallún, I finally had a quick lunch, another pintxo de tortilla (my diet starts this week) and some M&Ms. I also finally got a stamp in the bar in the credenciales. I debated about catching the next bus to Castro and coming back to this point the next day, but as there wasn’t another one for an hour, I went ahead and walked the last 5 km to Castro. Sámano has a nice church. I saw the sign that said Castro 2 KM and said “to hell with the arrows” as I was tired! It happened to be the Camino. I arrived to Castro and a walk along the beach before catching the bus to Bilbao just as it went away. I’m not sure when I’ll continue with the Camino (hopefully soon) as now I’m getting to a point where I’m going to want to stay in albergues and such, or kill my bank account with buses from Laredo and Santander to Bilbao. According to one guide, I’ve hit the 200 km mark. I’m not sure if I trust it or not. It seems I just hit the 100 km mark! I’ve been wanting to go back to León ever since that one night I spent in the capital on my way to Asturias in 2011. (How is that four years ago?) My time there, like so many of the smaller provinces, was too short, but it left an impression on me. On the Puente de Noviembre (long weekend/bank holiday for All Saints’ Day (Todos Los Santos) of 2011, I took off after work, excited that I was about to complete my goal of visiting every comunidad autónoma by arriving to Asturias the next day. I had already decided my next goal would be to visit every province (still working on that one), so I spent the night in León. My bus arrived about 10, if I remember correctly, and I checked in at the pensión/hostal (I forget which). The woman was one of the friendliest owners I have encountered in Spain. I went out to the Barrio Húmedo and had either tapas or a kebab, I forget which. It was cold, but being from Ohio, I relished the cold. I walked around a bit and got a good night’s sleep. I awoke Saturday morning to explore the city. I fell in love with the Cathedral, as I’m one of those who believe if you’ve seen one Spanish Cathedral, you’ve pretty much seen them are. However, the Catedral de León, one of the most famous of Spain, is special with its beautiful stained-glass windows. I also saw the Casa de Botines, designed by the famous Gaudí. I had a delicious café con leche y tostada con tomate near the Casa de Botines in a café, whose name escapes me, that left an impression on me (I still remember that breakfast.) I also enjoyed all the graffiti stating that León is NOT Castilla. I didn’t hear any of the dialect “leonés”, but I did see some of the graffiti. After strolling along the river a bit, I headed off to Asturias, anxious to set foot in the last of the 17 autónomas. Since then, I’ve been dying to go back to León. I almost took off for there a few times this year, especially because I wanted to be able to write the entry dedicated to León better. Alas, time and money never go together. I also remember being excited at seeing the arrows for the Camino de Santiago (Francés). The facts on León capital? It was founded as a Roman military encampment around 29 BC. Today it is a city of nearly 132,000 people and nearly 500,000 in the metropolitan area. León was once one of the most important kingdoms but was consolidated with Castilla in 1301. The Catedral of León, also known as La Casa de la Luz (House of Light) or Pulchra Leonina, was built on the site of Roman Baths. During the Reconquista, the baths were converted to a Palace. King Ordoño II converted the Royal Palace into a cathedral to show his devotion to God after defeating the Moors in 917. Alfonso VI consecrated a second cathedral in 1073. The third cathedral began construction in the 13th century but wasn’t completed until the latter part of the 15th century. Today it’s an important milestone on the Camino Frances, and I was glad I was able to see the inside of it for free (it was open on that Saturday morning), as the stained-glass windows are truly impressive. La Casa de los Botines is a house designed by Antoni Gaudí in the centre of León. It is four stories/storeys and has a basement and an attic. Gaudí used typical architecture from León, incorporating medieval and neo-Gothic influences. It was bought by the Caja España bank in 1929, and in 2010 merged with similar institutions due to the crisis (2008-???). It’s located near the Barrio Humédo, so named for the number of alcoholic drinks sold in this neighbourhood. The barrio has over 100 bars, centered around Plaza de San Martín and surrounding streets. For the non drinkers, the neighbourhood is also renowned for its tapas. Astorga has been on my radar for years, perhaps due to all the reading of the Camino de Santiago I did, dreaming of one day doing it myself. Ey, estoy en ello. Located on the River Tuerto 32,4 kilometres (27 miles) southwest of León capital, the city of 12,242 people (2009 records) predate the Paleolithic era. Today it is home of a Cathedral, the Gaudí designed Palacio Espiscopal, Roman remains, remains of the old city walls, and a chocolate museum. With nearly 70,000 habitants, Ponferrada is the last major city before reaching Santiago on the Camino Francés de Santiago. The city was an important mining town for the Romans. It’s home to the Castillo de los Templarios, a Templar Castle dating back to the 12th century. There is also a basilica, a Museum of Radio, el Museo de El Bierzo offering the history of the region, soon an Energy Museum (currently being constructed), and a few churches and érmitas (hermitages). It also offers a ton of opportunities for hiking/trekking and nature. Speaking of nature, located close to Ponferrada is the Natural Park of Las Médulas, a UNESCO World Heritage site since 1997. They were the most important gold mine in the Roman Empire once upon a time. Today it offers some amazing hiking routes and scenery. Ten kilometres away from the Camino de Santiago, the San Miguel de la Escalada is a monastery with Mozarabic art and architecture. It was consecrated in 951 around the time of the founding of the Kingdom of León. It was abandoned in 1836. Located five kilometres from Astorga, Castrillo de los Polvazares is a small pedestrian-only hamlet of 81 habitants. The entire village is made of stone. Houses, roads, everything is stone. It was important for the reconquista of Astorga during the Spanish Independence War. They do mention the city is overrun with tourists in the summer, so I’m making note to revisit León in the autumn or spring. Camino de Santiago Etapa 9. Bilbao-Ortuella. I found my Camino Mojo again, baby. After yet another job interview gone wrong, Thursday afternoon, I decided to go ahead and do the next strech of the Camino. There are a few ways to leave Bilbao, and an alternative route is walking along the river until you reach Portugalete as it’s easier, flat, and you don’t have to go through industrialized suburbia. I opeted for the one being marketed as the traditional one. As I have walked all over Bilbao many, many times, I went ahead and grabbed one of Bilbao’s free bicycles and headed toward Termibus. My favourite students live along this stretch of the Camino, which was recently covered with yellow arrows. It looks like someone had an accident with yellow paint. I had heard that the mountain climb was a bit tough, but I mean, after the mountains we’ve conquered so far on the Camino, it’s NOTHING! I stopped at the albergue and got an official Bilbao stamp, important as it has been my home for two very long years. The estastic feeling I had to be leaving Bilbao behind might be giving me a clue about whether I should stay in the rain Capital of the World. There was a lovely stroll through the hidden forest after crossing the Puente de Diablo (Devil’s Bridge). I was quite shocked as I had heard stories about how ugly this portion was. I did run into some goats who weren’t too keen on moving out of my way though. I also ran into a camping pilgrim who I chatted with briefly. It was a bit weird doing it in the afternoon, but on nice days like today, I prefer afternoon walking when it’s not too hot. 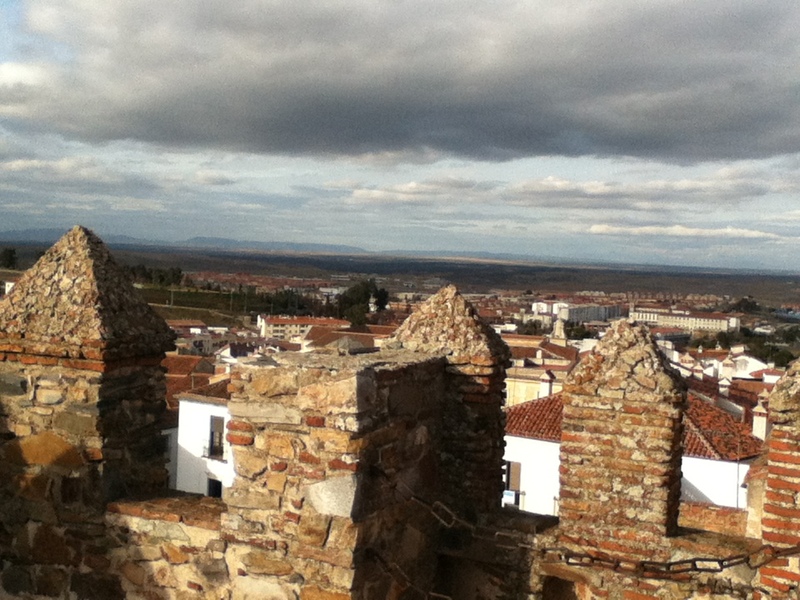 At Santa Águeda, I was trying to take a good shot of the ermita (hermitage), but a loud-mouth dog kept barking at me. I wanted to play with the Bernese Mountain Dog (I think it was one), but his noisy friend wouldn’t allow for it. I love dogs, but even the Basque doggies are a bit cold until you get to know them. At one point, pilgrims wanting to head toward the Camino Frances have the option of walking toward Burgos instead of on toward Santander. I’m sure it’s a beautiful Camino too. 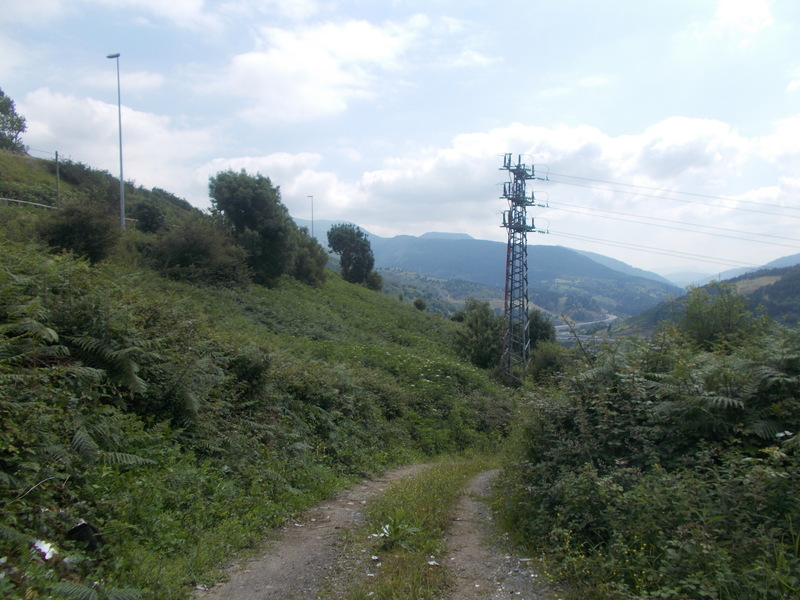 The Camino provided some beautiful views of the Greater Bilbao (Gran Bilbao) area, and I began the descent into Las Cruces, a neighbourhood of Barakaldo. The park the Camino goes through was quite nice. It reminded me a bit of the Parque de Oeste in Madrid, but even nicer. Then I arrived to the first circle of Camino Hell. I had just crossed the Puente de Diablo, after all. The Camino somehow manages to go through the big shopping centre complex Mega Park. And goes on and on and on and on past a McDonald’s, Toys R Us, Declathon, Eroski, and Ikea. As soon as there was a path along a river, I went along it. Eventually, near San Vicente, I began to see arrows again. Granted, I just crossed that busy street to find them and had to recross it again. Whatever, the Camino crossed the river leaving Barakaldo behind. I was hoping to have a café con leche and a pintxo de tortilla to fuel me, but the Camino didn’t really go by any nice ones to stop at. It joins the bike path in Sestao and avoids the town. There are a lot of views of the motorways/highways approaching and leaving Bilbao. Following the Camino arrows, I missed the turnoff to Portugalete, which is one of my fave places to visit. Darn. I ended up following the bike trail and found myself having to make a quick decision. Backtrack a kilometre or two, or take the wrong Camino (as there is an alternative Camino that passes through Ortuella) and have no buses or anything for 10 KM. It was about 8:00 PM, so I figured out which one was Ortuella, had a mosto (grape juice) and caught the 20:36 train back to Bilbao Abando. I feel like Quijote on an impossible quest to prove himself to Dulcinea, only instead of sweet Dulcinea, I’m trying to prove myself to the world and to Spain I’m worthy and good enough. I’ve been running around this beautiful country for seven years now, looking for myself, looking for my dream guy, looking for acceptance and friendship and a cureall to loneliness and fear and trying to become Spanish. Am I about to pick up and move again? Maybe. I’m seriously considering it. Bilbao is a lovely city on the rise. It has successfully rebuilt and rebranded itself from the “Cleveland and Pittsburgh and Detroit” of the peninsula of the 80s to a colourful, lively city with the Guggenhiem, BBK Live Festival, a brand new San Mames, the most beautiful metro (and Línea 3 is coming! Eventually!) Pintxo bars and happening places all around the city. But there is a downside to all that. There is a constant rain that even on nice sunny days is at the back of your mind, knowing that the sun has a limited lifespan around the time of a fruit fly. The Basques are the Basques. Not as reserved as advertised, but it is still hard to break in and meet people. Last year, I suffered from some horrible depression and anxiety to the depths of I am not about to go into. There has been an offer from someone wanting to try to change placements from Ávila to Bilbao. I am debating on trying it. I am facing my last year in Spain, I’m afraid, and I would like to go out on a high note. (More on that in a bit). There are quite a bit of places of and near the Basque Country I haven’t seen yet, and a few places that are demanding a full entry. Is that enough to keep me here? The pay would be the exact same, hours the same, but nearly half the cost of living. There are a ton of places near Ávila worth exploring. And two years later, I have yet to go out and really experience the night life of Bilbao because frankly, who wants to go back out into the rain after walking around in it all day? There are drawbacks, as Ávila is a very small city, I’d have a longer commute, and there is no gym that has Body Combat it seems. It’s also farther from the Camino, which I hope to get back out on this weekend. I am analyzing all these things, and more. I love Spain with all my heart, and I don’t ever want to leave it. However, somewhere along the way, I’ve forgotten why exactly. My studies of Spanish have fallen by the wayside. Sure, I have a C2 level and learn new expressions all the time. But my accent gets worse and worse as my jobs demand I not permit a soul to know I am fluent in Spanish. I am so burnt out by constant analyzing myself “Am I speaking English properly? Did I just accidentally mix conditionals in a non permitted by Cambridge way?” that the last thing I want to do at the end of the day is socialize. In an ideal world, I would be able to live in Valencia and make a living off my writing. I’d have that Spanish, Catalán or Basque husband to comfort me or to accompany me on my travels. I’d have two eager golden retrievers to take care of (after teaching Spanish children at the worst school ever in 2009-2010, I have decided I never want children.) I would be able to canvass this amazing peninsula, the greatest in the world, as much as my heart desires. In a less than ideal world, I’d at least be able to pursue graduate studies at the Univeristat de València in Hispanic Studies. I applied to this job very last minute in 2008 when I wasn’t accepted to either of the three graduate schools I applied to. I had spent five years dreaming of living in Spain, and for seven years, I have been living out the dream. A very difficult, lonely, isolating dream that has taken me to unimaginable places. And in the bottom of my broken heart, I know that ultimately whether I go to Ávila or stay in Bilbao, it’ll be my probable last year in the Greatest Peninsula in the World. Anything can happen. I could meet the boy of my dreams tomorrow. I could win the lottery. I could publish one of my novels which then became the publishing sensation of the century. But realistically, it’s time to start exploring graduate schools (which does include the exploration of the Univeristat de València), grow up, be an adult and let go of my dream of Spain. Your regularly scheduled Set Meravelles will return soon! Spain. The Set Meravelles of the Greatest Peninsula in the World. Today is the one-year anniversary of Set Meravelles. Hoy marca el primer aniversario de Set Meravelles. Thank you to my readers (averaging 300 hits a month! Yay!) and the people who support me and my crazy Quixote dream of staying in Spain in time of CRISIS. Gracias a todos mis lectores y las personas que me apoyan y mi sueño de locura de Quijote de quedarme en España en tiempos de crisis. Originally, I was going to do a revisit to the Set Meravelles of Vizcaya, as it is unfair to have grouped Bilbao and Vizcaya in the same entry as there are so many Meravelles in the province. (That goes for every province though!) Estaba pensado en hacer otra vez las Set Meravelle de Vizcaya, como es injusto hacer en la misma la entrada con Bilbao y toda la provicina como hay tantas Meravelle en la provincia. This is going to be hard. Impossible. In a country as amazing as Spain, you can not name just seven wonders. Impossible. So before I hear “You left out Lepe!”, keep that in mind. I tried to choose from a wide variety of interests for this list. I’m sorry for leaving out whichever wonder, but I can’t write about all 193829382938293918192383982495492 wonders of Spain. Es imposible elegir solo siete maravillas. Por eso, no te quejas que se me olvidado Lepe o tu maravilla preferida. Lo siento mucho, pero no puedo escribir de todas las 193829382938293918192383982495492 maravillas que hay en este país tan espectacular. He intentando incluir cosas de todas las intereses para esta lista. There are 17 autonomous communities in Spain, and each of them has a ton of history and amazing places to visit. I tried to spread the love, but the north seems to have more due to my love of the natural beauty found here. I also love Andalucía. Hay 17 comunidades autónomas en España, y cada uno tiene mucho historia y sitios preciosos para visitar. He intentando incluir un poco de todo, pero hay más en el norte porque me encanta la belleza natural del norte. Pero también me encanta Andalucía, tranquilos. What are your choices for the Meravelles of Spain? I’ll probably agree with whatever you write as long as it’s not Madrid city! ¿Cuáles sitios elegiría tu para las Meravelles de España? Probablemente voy a estar acuerdo, menos los que dicen Madrid capital xD. 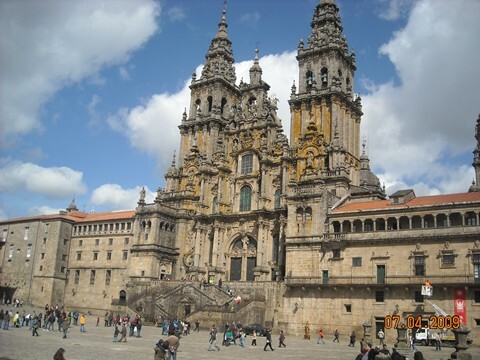 No matter which Camino you take, how you do it, where you leave from, how much of it you do, the Camino de Santiago is a unique experience. Most people who have done it say it was one of the best experiences of their lives. I’ve only done about 120 kilometres so far, but I cannot wait to arrive in Santiago. No matter wherever you are in Spain, you’re not far from some Camino to Santiago. Granada remains one of my favourite cities in the world. Although I’ve only been to the Alhambra once, I’ve been to the city four times, and I am looking forward to a fifth time in the future. 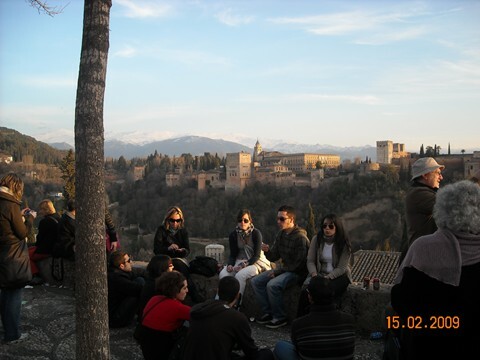 For me, the best of the city lies directly opposite the Alhambra: Watching the sunset from Mirador de San Nicolas. Ay, mi Valencia (i la seua caloret). I wanted to include a festival on here, and after living through the Fallas in March 2011, no other Spanish (or any place) festival compares with the awesomness of the Fallas. And the paella is amazing for the foodies. Ay, Donosti. I agree with the guide I read during my first visit to this city. There may not be much to see, but it’s a place you have to see. I probably have offended every single person I know in Bilbao by listing it and not Donosti, but I will also remind them of Miguel de Unamuno’s quote about Donostia being beautiful but insignificant. Although it’s difficult to find good weather, their beaches are among the best in the peninsula for me. I love sitting along the rock along the river watching the wave crash into the shore. The best thing about Madrid is its connection to three amazing Castillian province capital cities. Toledo is beautiful and medieval, Segovia has its Roman aqueduct and Alcázar that inspired Disney’s Cinderalla Castle, and Ávila is also a charm that’s a bit more off the beaten path. When I saw this bridge with its cross where the Reconquista of Spain supposedly began, I felt moved. I can’t explain it. The nearby Basilica of Covadonga and the church in a cave are also jewels of Asturias, and I can’t wait to see the lakes of Covadonga. But it is the bridge and the Asturian cross that somehow spoke to me most. What would Spain be without Quijote? Although a fictional character, Don (Sir) Quijote says so much about Spain. I think my dream of staying in Spain long-term is becoming a bit quixotic itself. Many Spaniards boast of never actually having read this brilliant novel, but they are most definitely missing out. Last week, when I tried helping some French pilgrims on their way to Santiago who didn’t know Spanish, it made me stop and think how fortunate I am to have begun learning Spanish when I was 13. I forget that not everyone has studied Spanish, and many times it makes me frustrated as I have put so much effort in my life into this amazing language (and now I’ve added Catalán and Italian to the mix). So…I wanted to write up a few basic words to help pilgrims who are keen on doing the Camino but don’t know the difference between “hola” and “hasta luego”. This can also work for travelers to Spain who just want to enjoy the beach (playa) and sangria and siesta (nap) and fiesta (party). Learning just a few words when travelling always enhances my experience. ¿Habla(s) alemán? : Do you speak German? ¿Habla(s) frances? Do you speak French? Buen Camino: Good journey to Santiago! Soy peregrino: I am a pilgrim. ¿Cúantos kilometros a…? : How many kilometres to…? Tip! You can ask for “un vaso de agua” (a glass of tap water) free when you order something. Me duele: My ….. hurts. You can point to what hurts then. If you’re doing the Camino del Norte, a couple of Basque (Euskera) words. No one expects you to speak Basque, but an “aupa/kaixo” (Hello!) and “agur” (goodbye!) will forever endear you to the Basques. Buen Camino! If there are any words you want to know, just ask, and I will gladly teach you! For those learning Spanish (or Spanish people learning English), the best advice I can give you is DO NOT TRANSLATE LITERALLY as “Spain is the milk” does not make any sense in English, nor does “España está follando guay” make any sense in Spanish. It was a lazy day today, but I’ve arrived to the Capital of the World, Bilbao. I slept about an hour and a half after my alarm went off, and I wasn’t sure I was going to go ahead and walk those 8 kilometres or so from Zamudio to Bilbao, where I live. After checking the weather forecast, I decided to go ahead and go for it as who knows when time and weather will coincide again. I had my token pintxo de tortilla y café con leche before catching the Euskotren to Zamudio. The grey skies matched my rather blah mood today, which I still haven’t been able to completely shake. It didn’t rain, though. Thank God for small favours. There are two ways to conquer Mount Avril. I took the one from the center of Zamudio (population 3263) and walked through the streets and past the building I had been seeing from my workplace of the past two years a few kilometres away. The walk was not the finest point of the Camino as it’s a rather industrial area. There were some nice views of the Txorierri valley and the Bilbao airport as I climbed Avril, a mountain I’ve been saving for the Camino. I saw more angry dogs than people, and I didn’t see a single pilgrim. Granted, I also took off as the Zamudio church bells were chiming noon. There was a nice little information plaque where people had written messages to motivate peregrinos. I signed the guest book (¡Hola! if anyone found this through the guest book :)) and felt a bit more encouraged. The arrows took off, perhaps by joke, through a small trail to the top of Mount Avril when I thought it was time to be descending. There was barely any room to move through the plants. I should’ve stuck to the Gran Recorrido trail, but I reached the destination all the same. I crossed the pedestrian bridge over the motorway and admired Bilbao, where I’ve been living for two years. I tried to stick to the Camino, but as I tend to explore random streets when I’m bored, I may have misstepped a bit. I arrived at the Basilica de Begoña that officially welcomed me to El Botxo, Bilbao, Capital of the World. I thought I would be feeling excited, or something, to have reached the city where I have lived for two years on the Camino. I didn’t really feel anything. I’ve descended those steps down to Plaza de Unamuno so many times that perhaps that’s why it didn’t feel real. So…while I have been having a blah day, I am excited about having walked from Irún to Bilbao since last August.